The Longford Riverside Caravan Park is located in Longford, app. 20 minutes west of Launceston, Tasmania. The Caravan Park is situated on the banks of the picturesque Macquarie River and includes camp sites, caravan and cabin accommodation. The park offers quality sites, riverbank walks and excellent freshwater fishing. Accommodation includes 58 powered sites, all with silage and water. There are 20 un-powered sites, some located on the river bank. The park has 1 cabin, 1 on-site van and 2 units. The units sleep one to four guests and all have electric blankets, television, heating and a kitchen to prepare meals. The on-site van has an en suite bathroom and the units both have a toilet. 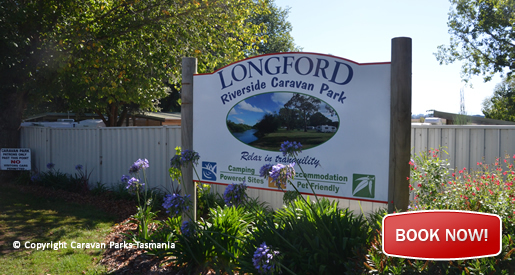 General facilities at the Longford Caravan Park include two amenities blocks, laundry facilities, spacious camp kitchen and barbecue area. Longford is a small town in the north-east of Tasmania, Australia approximately 20 minutes from Tasmania's 2nd largest city Launceston. It lies 175 m above sea level at the convergence of the Macquarie River and the South Esk River. It is just south of the Illawarra Road, a road connecting the Bass and Midland Highways. Longford has a population of just over 4000 people and is part of the Northern Midlands Council area. The region is predominantly agricultural, noted for wool, dairy produce and stock breeding.